Park Place Hotel - SOLD OUT! *Rates available 2 days before and after the conference, subject to hotel availability. Cherry Capital Airport (TVC)is located approximately 12 minutes (6 miles) from the Park Place Hotel and is serviced by major airlines. Scheduled service is provided by American Eagle, Delta, and United Express via Detroit or Chicago. Please visit the website for more information. The hotel offers a shuttle service from 8:00am-9:00pm at no charge. After baggage pickup, the hotel may be called at (231) 946-5000. Cab fares cost approx. $17 to or from Cherry Capital Airport. Cherry Capital Cab Company may be reached at (231) 941-8294 or www.941taxi.com. Welcome to Traverse City, known as the Cherry Capital of the World! This northern Michigan city was ranked 4th on the Smithsonian’s Top 20 Best Small Towns list to visit in the U.S. in 2015. Our late October timing should bring colorful landscapes of fall foliage. Located on beautiful Grand Traverse Bay, many destinations are a few steps away for great shopping, great food, and plentiful natural resources. The picturesque Sleeping Bear Dunes National Lakeshore is close by, and offers stunning views of Lake Michigan. Many tours are available for beer, wine and spirits adventures. Located on the 45th parallel north, the surrounding countryside is one of the centers of wine production in the Midwest. With more than 10 microbreweries in the area and several distillers, there is something for everyone’s tastes. And don’t forget to stop into the Grand Traverse Pie Company, or Cherry Republic, just to name a few local shops. The Michigan Liquor Control Commission looks forward to welcoming you to our Great Lakes State. We will kick off the regional conference with a Welcome Reception in the Top of the Park at the Park Place Hotel on Sunday evening at 6:00 p.m. Located on the 10th floor, this area offers a sweeping panoramic view of Grand Traverse Bay, the downtown and surrounding areas. For the President’s Dinner on Tuesday night, we will venture a short drive out of town on chartered buses to Old Mission Peninsula, for a memorable dining experience at the historic Bowers Harbor Inn. 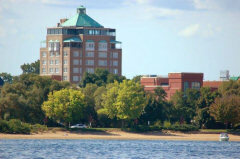 The grounds, garden and patio associated with the Peninsula Room provide breathtaking views of West Grand Traverse Bay. We hope you enjoy your stay in Traverse City and take the time to explore all the things making this city one of the Best Small Towns in America. The conference theme is "Bridging the Past to the Future." Michigan is a unique state, having two peninsulas. One of the landmarks of Michigan is the Mackinac Bridge, which replaced ferry service between the Upper and Lower Peninsulas in 1957. Serving as a symbol of progress and economic development, especially for reasons of tourism, the bridge makes an appropriate symbol of the 2016 Central/Western Regional Conference. The business agenda covers a wide variety of topics and issues in this ever changing world of alcohol regulation. Featured panel presentations include discussions on the many trends in this industry, economic impacts and regulatory challenges relating to alcoholic beverage licenses, and other current topics as described in the Business Agenda. To view the entire business agenda and a partial list of alcohol beverage experts serving as presenters, just click on the links below. The social agenda will offer a networking reception in the Top of the Park at the Park Place Hotel, as well as the President’s Dinner at the historic Bower’s Harbor Inn. Monday evening is intentionally left open for you to enjoy the Traverse City area and its many unique offerings. All meals have been carefully planned to offer a nice selection to accommodate every taste and temptation. Early conference registration ends Monday, October 3, 2016 so don’t delay! The registration fee increases $50.00 on Tuesday, October 4, 2016. You have the option of paying by credit card or check*. The registration fees are outlined below. mail it along with a copy of your registration confirmation to: Teri L. Quimby, Chair, NCSLA Central Region, P.O. Box 14285, Lansing, MI 48901. *Please note that payment by check is not available after October 14th. CANCELLATION POLICY: All refunds are subject to a $200.00 deduction. Due to contractual commitments there will be NO REFUNDS AFTER OCTOBER 14, 2016. NCSLA Federal Tax ID Number: 52-6043243. ATTIRE: Attire for all scheduled business and social functions is business casual. The average high/low temperatures in Traverse City are 65° / 40° F. There is a possibility of rain, so be sure to plan for rain in addition to fall weather! SPECIAL NEEDS: Individuals with disabilities or special dietary requirements who need special accommodations should email Teri L. Quimby at tquimby@ncsla.org to make arrangements. Requests should be made no later than Friday, October 14, 2016 to allow sufficient time for us to meet your needs. Marco D. Costales, Esq. Nossaman LLP Partner & Chair of Business Transactions and Public Policy Dept.